Dogpatch is a slice of San Francisco with a distinctive and colorful history, a history tied closely to the once-booming industrial economy centered in the city's Central Waterfront. Located on the flats east of Potrero Hill, Dogpatch is an approximately nine square block area, generally bounded by Mariposa Street to the North, Tubbs Street (23rd) to the South, Highway 280 to the West, and Illinois Street to the East. Dogpatch contains architecturally and historically significant workers' cottages, factories, warehouses and public buildings constructed between 1860 to 1945. It is one of the few neighborhoods to survive the 1906 earthquake and fire, and it is gateway to the oldest, largest and most intact historic industrial complex remaining in the city–the former shipyards and mills on the waterfront at Pier 70. The Gold Rush, starting in 1848, is undoubtedly the most well known event in California history. By 1852, two years after California joined the United States, San Francisco had been transformed from a sleepy outpost into a great world seaport and metropolis, with a swelling population of mostly young men out for the adventure of their lives. Some of them eventually ended up working in thriving industrial enterprises in the Central Waterfront. 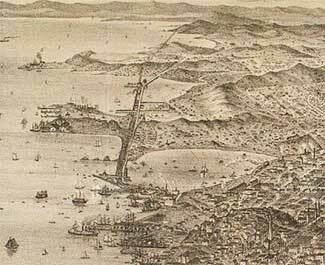 The earliest enterprises in the area began on a lonely patch of land protruding into the bay at Point San Quentin, later known as Potrero Point. 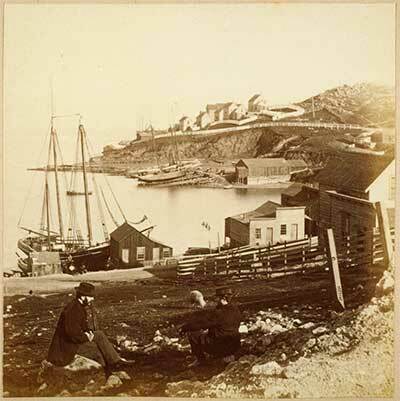 An 1862 photo of Potrero Point by Eadward Muybridge. The men in the foreground sit near what would now be around Illinois St. and 19th at the Eastern edge of Dogpatch. The landscape has changed dramatically over the years as hills were leveled, docks were built, and portions of the bay were filled in for further industrial development. Note the early dwellings on Irish Hill in the background. 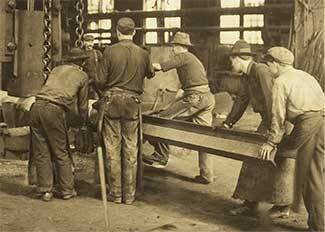 By the late 1860s the area had developed into the City's most dense and important center for heavy industry, employing thousands of industrial workers and skilled craftsmen. It was during this period that the Dogpatch neighborhood sprang up, established initially by young Irish, Scottish, and English immigrant workers. Later waves of immigrants settling in Dogpatch included Italians, Scandinavians, Mexicans, Dust Bowl migrants, and African Americans. Industrial development of the Central Waterfront and the establishment of Dogpatch and Potrero was fueled by the availability of cheap land and the opening of Long Bridge, a wooden causeway across Mission Bay completed in 1865. The bridge stretched over the Mission Bay marsh lands, through the Islais Creek basin to Hunters Point, terminating at the ornate Bay View Race Track. Long Bridge covered what is now Third Street (known at the time as Kentucky Street). The construction of Long Bridge successfully connected downtown San Francisco to the Central Waterfront, but it had the environmental effect of sealing off the larger western part of Mission Bay, leading to the eventual filling in of the tidal lagoon. In many ways Dogpatch resembles the mixed industrial/residential districts that existed throughout the vast South of Market area before the 1906 Earthquake and Fire swept them away. Thanks to its then-isolated location and protection from the marshland that surrounded it, Dogpatch managed to escape the disaster. 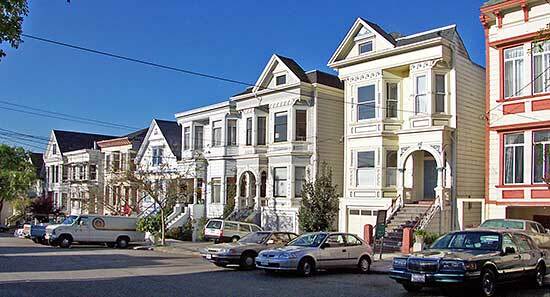 As a result, it contains housing considered ancient by San Francisco standards. Dozens of rare and architecturally significant buildings and homes built between the late 1860s and 1910 can be found scattered throughout the neighborhood today. 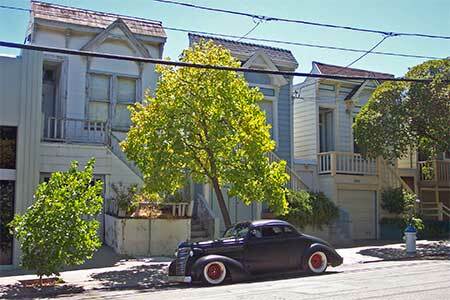 Most houses in Dogpatch were built by working families, often with their own hands. 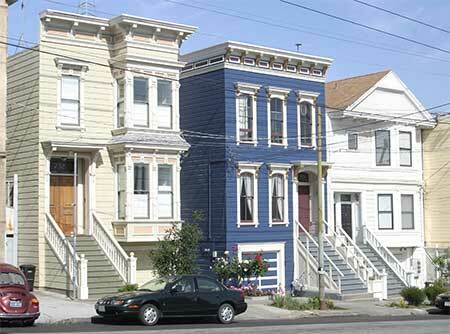 Typical of the Dogpatch neighborhood homes are more than a dozen quaint Victorian-style houses designed by the architect Jon Cotter Pelton Jr. in the early 1880s. At the time, Pelton published his design specifications for free in the San Francisco Evening Bulletin, so homes could be built at a price that was within the industrial worker's reach. Thirteen of these dwellings can still be found in Dogpatch, on Tennessee and Minnesota Streets, between 22nd and 20th. 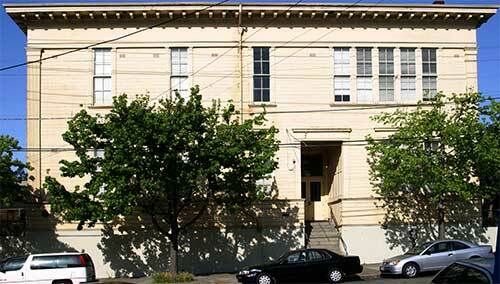 San Francisco's oldest existing public school building, Irving M. Scott School, was built in 1895 to serve the children of Dogpatch. The three-story wooden structure, named for the head of the nearby Union Iron Works ship yard, still stands at 1060 Tennessee Street. Just up the street at 1009 Tennessee is one of the City's oldest firehouses. A handsome two-story brick building, San Francisco Firehouse No. 16 was originally constructed in the late 1890s, when fire wagons were powered by teams of horses. According to a 1999 survey conducted by the Foundation for San Francisco's Architectural Heritage, the residents of Dogpatch rented or owned their housing in nearly equal proportions until after World War II, when absentee owners began to buy up the housing stock. Almost three-quarters of heads of households in Dogpatch worked for one of the district's large employers, such as Union Iron Works/Bethlehem Steel, the Western Sugar Refinery, and Tubbs Cordage Company. All of the existing historic buildings and culturally significant artifacts remaining in Dogpatch have been carefully researched, photographed and cataloged by volunteers from the neighborhood and the Foundation for San Francisco's Architectural Heritage. Together, they succeeded in having the neighborhood officially declared an historic landmark district. By the mid-1940s, the Central Waterfront's glory began to fade, and Dogpatch was hard hit by a 1ong, slow period of industrial decline. The local shipbuilding industry died out after World War II. The maritime industry diminished as shipping went to bigger, more modern ports in Los Angeles, Oakland and Seattle. Factories closed. Workers moved away, and many homes and factories were demolished. By the 1950s and 1960s, Dogpatch gradually changed from a proud working- class community into a physically blighted area. The Dogpatch neighborhood began to experience an urban renaissance of sorts in the late 1970s, at a time when arson, decay and demolitions were reaching epidemic proportions. A diverse collection of people, including many artists and creative professionals, purchased run-down but affordable Victorian cottages and Edwardian flats in the area. They fixed up the neglected properties and transformed the once-dying area. New types of business and industry discovered the special charm of Dogpatch, and moved in, too. Esprit Corp. transformed an old wine warehouse on Minnesota Street into the headquarters of a world renowned fashion and lifestyle company. Gentrification had begun. By the mid-1990s, after twenty-five years of gradual change, a rapid wave of development started taking place, mostly in the form of "live-work" loft units. Hundreds of these units were built in a few short years. Much of the development occurred on empty lots, but by the late-1990s preservationists noted a disturbing trend taking place: historic structures and warehouses were being destroyed to make way for new loft developments. 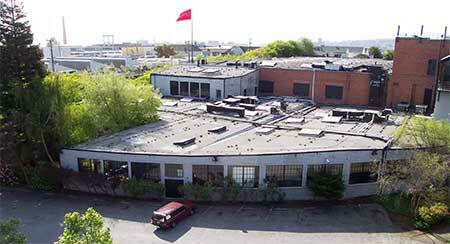 Large new loft buildings, combined with the continued dis- placement of industrial workers and businesses, began to seriously change the scale and character of the neighborhood. Other major projects nearby made Dogpatch even more attractive to developers, includ ing PacBell Park, the UCSF Research Center, and Mission Bay, the largest-ever mixed use project ever approved in San Francisco. A new high-capacity light-rail line along the Third Street corridor is scheduled for completion by 2006, prompting further growth and development. Pressure has been mounting to rezone Dogpatch from a mixed use industrial and residential area into a live-work area. Concerned about rapid and often poorly planned development that was threatening historic resources and changing the unique character of the area, a group of local citizens and businesses formed the Dogpatch Neighborhood Association in 1998. The group was established to monitor issues relevant to the neighborhood and to encourage thoughtful and visionary urban planning that respects, celebrates, and preserves the character, integrity, and quality of life of the area as it evolves for the 21st Century. The Dogpatch Neighborhood Association is actively involved in a range of other critical issues that impact the community – including historic preservation, long-range urban planning, neighborhood improvement, public safety, environmental and health issues, transportation, parking and traffic, and acquisition and improvement of public open space. It works in conjunction with other community groups and City agencies, including the San Francisco Planning Department, the Port, MUNI, DPT, the Police Department, and City Hall. Today, Dogpatch is a neighborhood in transition. It maintains an offbeat, quaint, populist appeal, dating back to its working-class roots. But as the mix of residents and businesses continue to change, the character of the area could soon disappear unless steps are taken to save it. Neighbors hope that planners and developers will build from the legacy of Dogpatch's colorful past in guiding the district to an even brighter future. San Francisco will lose more than it can afford if it does not protect this vibrant urban neighborhood and its extraordinary monuments to an earlier time.